Black Old Navy Scarves first surfaced on Chictopia's streetstyle gallery in Summer 2009 seen on Spokane blogger courtneycrunk. She wore her black Old Navy scarf with a beige thrifted jacket, white kohls t-shirt, and blue Levis jeans. 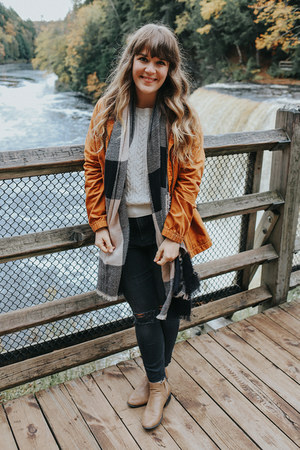 Since then, Black Old Navy Scarves have grown in popularity as bloggers from Hooper, Spokane, and Carson City have discovered them. Black Old Navy Scarves are generally seen in casual, trendy, and eclectic style. Popular types of Black Old Navy Scarves are chunky knit black, knitted, and wool. There are currently 7 streetstyle photos of bloggers wearing Black Old Navy Scarves. Most recently, blogger DailyFashionista of thedailyfashionista.blogspot.com wore her black Old Navy knitted scarf with a tawny Kimchi Blue platforms shoes, light purple Forever21 floral dress, and camel vintage kniited sweater.